Incomedia WebSite X5 Pro Giveaway Contest! Incomedia, the makers of WebSite X5, has generously offered Dave’s Computer Tips three (3) licenses for three lucky DCT Readers. These licenses carry a value of $199 (US) each! This is professional software folks, in every sense of the word. 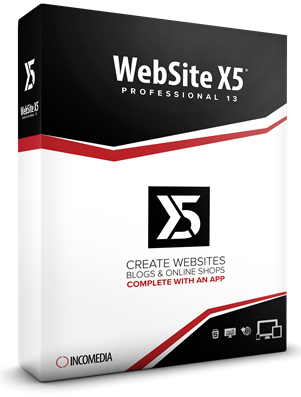 WebSite X5 Professional is the right tool for building SEO-ready websites, blogs and online stores with mobile Apps included. Following responsive design, sites can automatically switch and adjust to any device, including tablets and smartphones. Despite being a step-by-step builder, WebSite X5 Professional has been developed to suit designers’ and developers’ needs for professional-looking sites and features loads of tools and advanced functions. Pros will get the most out of a tool which is both powerful and easy-to-use, whose benefits are: flexible user experience and customization; fast-paced workflow; up-to-date projects; cost-effective investment. We’d appreciate it if you’d take a moment and submit a comment telling us why you’d like to win WebSite X5. However, submitting a comment is not required to enter this contest and will have no bearing on your chances. WebSite X5 Evolution Pro aimed at allowing beginners to create a website without any knowledge of HTML. It uses a drag-and-drop interface to create pages and features like blogs and online stores can be added. It is also possible to create password protected members areas. With these specific features, I would like to win this product and have a trial on it. I’ve been limping along with an almost ten-year-old version of Dreamweaver. WebSite X5 Professional would definitely be a step up. Thanks, Richard. Thanks for the contest DCT. I utilize Website x5 already. The home edition. Love it. Makes web design so much fun.